A group of businessmen with a sinister secret! 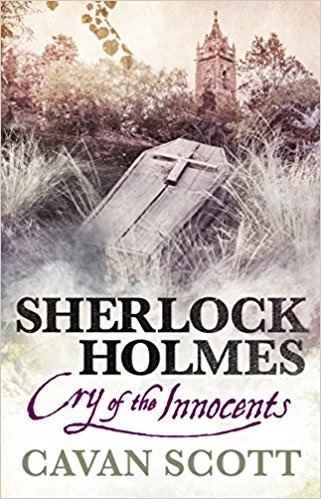 A Catholic Monsignor makes it to Baker Street only to die before he can gasp out more than “Signore Holmes—Il corpe!” This sends Holmes and Watson to Bristol, where another Catholic Priest is suffering from what seems to be identical symptoms. Holmes is convinced that the men were poisoned! Holmes and Watson stay at the Bristol Regent, a hotel that is owned by a lady for whom Holmes had solved a case. She seems delighted to have them. Watson learns of the miracle of Edwyn Warwick—a businessman who was said to have an uncorrupted body. also Despite his uncorrupted body, he made the bulk of his money in the slave trade and believed in workers taking what he gave them and be glad they got paid at all. The local businessmen have a secret lodge devoted to making money the Warwick way, minus the slave trade. They have Warwick’s ring and wig on display and his preserved body as well. All three are apparently stolen! Meanwhile, Holmes is in jail accused of stealing his host’s valuable books! Unable to keep his room at the hotel, Watson is taken in by a member of the lodge, Lord Renshaw. Two other members of the Worshipful League of Merchants are also staying there, Renshaw’s son-in-law Howard Clifford, and his prospective son-in-law, Victor Sutcliffe. The two men could not possibly be more different. Clifford is a tad backward and has a constant stutter. Sutcliffe believes himself to be entitled and his arrogance is readily apparent. Neither are what they seem. Both are definitely followers of Warwick’s plans for gaining riches. With Holmes now in the jail’s infirmary, having been badly beaten in his cell, Watson is left to fend for himself in solving the crime. That is until Sherringford Holmes, Holmes’ other brother, shows up in Bristol!